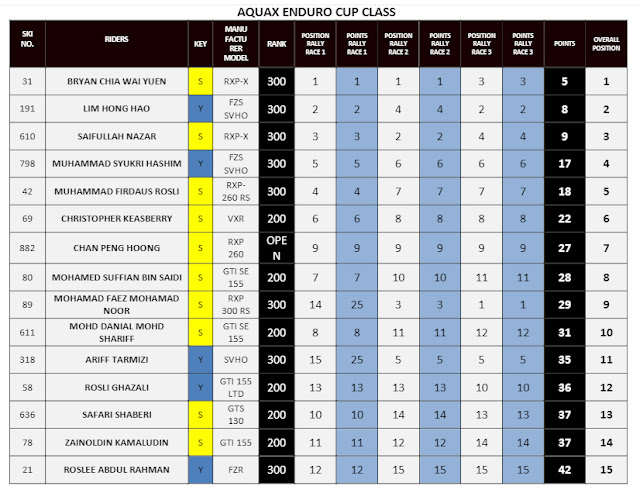 The 2016 P1 AquaX Malaysia Series that was held at Metropolitan lake in Kepong has come and gone with some amazing races on a rain-soaked weekend. If you are looking for the photos, you can view them here. I was at the venue for both days with a bright Saturday morning greeting the racers and officials as everyone got themselves busy at the Dry Pit as well as on the course itself. I went out to check on the course layout so you can watch the video below. Calm lake with just one Jetski flying across the lake at 50 - 70 km/h. Very different to the actual race where the lake turn choppy with the riders creating waves in their path. 24 competitors was competing among themselves throughout the weekend across 3 categories - Sprint Spark (12 mins + 1), Sprint Ski (10 mins + 1 lap) and Enduro which is a 30 minute race + 1 lap with the 200hp and 300hp category riders racing at the same time. 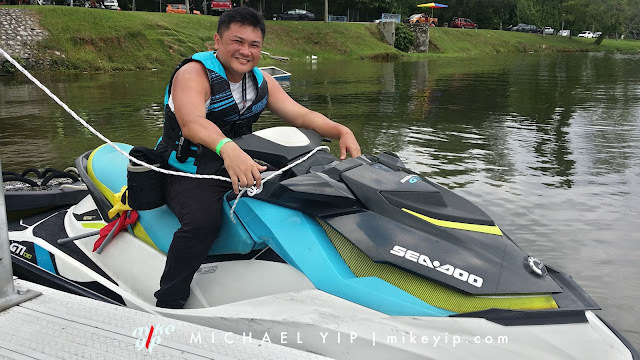 Was told by one of the Spark category rider that it's not easy to hang on to the Jet Ski when it is propelling across the surface of the lake at speed. Imagine what the Enduro racers goes through as they have to hang on to the craft for 30 minutes while racing against 14 other riders. Nineteen-year-old up-and-coming Malaysian jet-skier Bryan Chia took first place in today’s Enduro race, a category that challenges the endurance of racers in a 30-minute long battle around the designated lake circuit. Bryan, who was in second place for the first half of the race, surged into the lead and held on to win after race leader Mohamad Faez suffered from technical difficulties and had to pull out. In the Sprint Spark category, another 19-year-old, Mohd Danial Mohd Shariff heads the standings going into Day 2 after placing third in the first race and winning the second. He is chased by 34-year-old veteran jet-skier Raja Nazrin Shah, who won the first race of the day, and Saifullah Nazar, who are both tied in second place. In the Sprint Ski category, 39-year-old Hj Idzam Horhadi Hj Mashud won both of today’s races to command a lead at the top of the standings, while brothers Muhammad Syahmi Hashim and Muhammad Fadhli Hashim are tied in second place. I must say that the atmosphere got a little bit tense when the storm came in and lasted for over an hour, but it was great to see that the riders remained gung-ho and ready to take to the waters. By the time the last race was done, it was close to 7pm and I went back to the comfort of the secretariat to chill. Wouldn't want to use up all the energy on just the 1st day, do we? Day 2 kicked off bright and early, with a quick brief from the course official and the first boat went down to the lake by 9am raring to go. As majority of the race on the previous day was hampered by the rain, The organizer along with the teams agreed to get the race started earlier than the scheduled time to avoid a similar situation. With the shorten duration to prepare, the teams goes into a frantic mode as they get the jet skis ready with final fixes and set-ups done. No one is holding back despite needing to race twice, especially the Enduro boys. It was full throttle from the flag-off for 30 laps and they have another race few hours later. It's tiring especially to the arms as the 15 riders not only have to maneuver around the obstacles, they also have to get ahead of each other while racing at top speed skimming across the lake. The Sprint Sparks and Ski points is still up for grabs but the Enduro crowd favorites, Chris (200 HP) and Bryan (300 HP) was already set to dominate their respective categories in the race as their jet skis and strategies from day 1 was flawless. "It was fun and I hope to maintain my performance in the next two rounds." said the 19-year-old, who has been racing in Jet Ski competitions around Asia for the last five years and hopes to become a World Champion one day. "I have been racing for many years but I think this is one of the best performances in my racing career because I have never done so well in an endurance race. I have been training intensively since August and keeping myself in shape, so it’s a good win." said the 47-year-old. Second place in Enduro 200 was Mohd Suffian bin Saidi, while Rosli Ghazali, one of the local otais of the sports took the final podium spot. The Sprint Spark category, which is a newly launched class designed to attract entry-level amateur and semi-pro riders racing on sit-down jet skis, was contested by six riders this weekend. After winning one race yesterday and emerging third in the other, 19-year-old Mohd Danial Mohd Shariff led the Sprint Spark standings coming into Day 2 and continued his fine form with victories in both races today to collect 75 points and take first place. "I feel grateful for this victory as I have been training very hard every week. I have been jet-skiing for five years and this is my best performance so far." said the 19-year-old who hopes to turn professional soon. Finishing in second place for the Sprint Spark category this weekend was 34-year-old Raja Nazrin Shah (65 points), third place went to Saifullah Nazar (63 points) and coming in fourth was Megat Redza (61 points). The only female rider in the event, 29-year-old Yushi Chan, finished tied in fifth place on 50 points with Mohammad Farid Mohd Zain. "I was racing against competitors much younger than me so I feel very happy to achieve this result in the Sprint Ski category. It has been a long and tiring but very fulfilling day." said the 39-year-old, who is the only other Brunei rider in the competition. The next two events in this three round Malaysia series will be held at D’Island Residences, Puchong on 26 & 27 November and 10 & 11 December (Grand Finals), where the overall Malaysian Champion will be crowned. Entrance to the event will remain free for members of the public who wish to catch the races. For photos from the race, it's all here. See you at the next race? This post is just on all the photos from the 2016 AquaX Malaysia Series Round 1 held at the Metropolitan Lake in Kepong. Results of the race updated here. What a fantastic end to round 1 and can't wait for round 2. For the riders heading off to the other competitions in the coming week, stay safe, good luck and see you soon at Round 2. More and more people is going into blogging and wants to find ways to monetize their blogs to make money. And then the complain starts, like why they don't get much viewership other than their own family member and friends after they spammed the link on Social Media. Or why they are ignored by advertisers and brands and so forth. I know you feel dejected but trust me, you’re not the only one to struggle! There are several common mistakes that newbie bloggers make. Here's 8 reasons why no one is reading your blog – and what you can do to turn things around. I know you love your blog and what you can do. You can also preach about how well you write and how beautiful your photos look but readers don't care if you can write a thesis about a yawning with passion. What they want to read are topics that they can relate to. Don’t push your product or your own agenda directly. Figure out who your readers are. Then create content that holds value and interest for them. Share your blog posts on your Facebook, LinkedIn and Twitter pages. It’s also a great idea to include ‘share’ buttons on your blog. This makes it easy for readers to share your posts on their own social accounts, spreading the love even further. But wait… You also work for a living! You don’t have time to bash at the keyboard constantly. Writing quality blog posts takes time and effort. How can you achieve that amount of blogging when you have a million other things to think about? The current generation is insanely mobile. For most of us, our smartphone is an extension of our own body. It goes everywhere we do. Need to cheat on a pub quiz? Catch Pokémon at work? The answers to all of life’s questions are at our fingertips, thanks to the internet and the incredible proliferation of smartphones. Creating a successful business blog takes planning and hard work, but if you keep following the best practices outlined here, you’ll slowly and surely see results. Good luck! Some friends came back recently and thought what better way to catch up than over food? 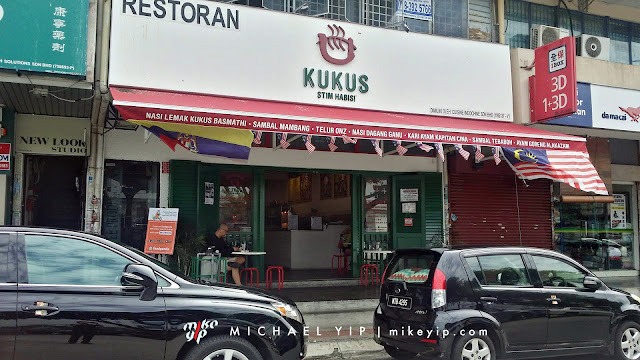 And an ex-schoolmate of mine just opened Kukus in Taman Tun Dr. Ismail, in a way, quite centralized for all of us from the surrounding area. Only annoyance I face with the area is that humans like to double park their cars in the tight single lane road in front of the shops rather than the big car park across the road. Simply because it's "more convenient and it's just for a short while". If it's low traffic period, I've no issues with it but it's a business area and traffic are constantly flowing and when 1 car can't get through, it creates a chain reaction that goes around the block. Sorry, I digressed. You won't miss the restaurant as the sign's quite clean and big. The shop's pretty new, space wise, the place can sit quite a number of pax. To order food, you basically pick out the dishes or set meals you want from the big signage behind the cashier and place your order at the counter ala Fast Food Restaurant style. By the time you reach the collection counter, the food is all ready for you to collect. But being a new restaurants, there's bound to be some hiccups, especially when there's more customers. I started my brunch with a nice hot cup of local coffee, half boiled eggs (Telur Onz) and toasts. Quite typical dishes, but the eggs was about 30 seconds over but then, I'm just picky with how I like my half boiled eggs. The coffee wasn't too sweet compared to a lot of kopitiam styled restaurants that I ate in. That's good as some places, despite having a small cup to play with, tend to put more sugar than required and killed the bittersweet taste of the coffee beans. Next on my agenda was the set meal, They have the Set Kukus Ekonomi, Set Kari Kapitan Cina, Alakazam, Master Dulang, So depends on what you want, the Master Dulang is the biggest portion with a good variety of curry and sambal for you to go crazy with. I went for the Set Kukus Alakazam, it comes with a huge fried chicken drumstick. A good touch by the cashier was asking me the type of sambal I like, from the mild spiciness upwards. It's nice especially for a person like me that's pathetic when it comes to spicy food. I went for the mild one. The rice was steamed to the right texture, the fragrant is there too along with it, there's some vegetables (which I have no love for and told them to skip on mine so that it won't taint the dish) and fried chicken along with the usual peanut and anchovies. I think aside from Village Park and Ali, Mutu and Ah Hock, this is the other shop that I know that serves such a huge piece of fried drumstick. But then, those two places are the only ones I've been to so if there's other places you think I should check out, do let me know by commenting below. I'm not going to compare the way the chicken was fried as it's a totally different style. Most important for me is that the skin is crispy even though it left the kitchen for some time and the meat is properly cooked as I've encountered some restaurants that has rare meat around the bones because of the size of the meat. Would I eat there again? Definitely, not just because the place belonged to a friend (he's based in Singapore anyway) but the food is pretty good too. There's still quite a number of other dishes for me to try so I'll update this post as I eat more. I beg to move the Bill intituled "An Act to apply a sum from the Consolidated Fund for the service of the year 2017 and to appropriate that sum for the service of that year" be read a second time. 1. Praises be to Allah, for His blessings that we are gathered here today, 21 October 2016, for the tabling of the 2017 Budget. 2. Peace be upon Prophet Muhammad, the chosen messenger. 3. Dear Allah, the Best Planner, we pray for Your guidance and we seek for Your grace. 4. We like to take this opportunity to welcome home the 23,000 Hajj pilgrims. May your Hajj be accepted by the All Mighty. InsyaAllah. 5. Since the past six decades, many budgets have been tabled. 6. The first post-independence budget was presented in the parliament in 1959 with only a total allocation of RM888 million, while the current 2017 Budget stands at RM260.8 billion. 7. For the past 60 years, the Parti Perikatan and now, the Barisan Nasional Government has successfully sustained the GDP growth at an average of 6% per annum. 8. The 2017 Budget allocates a sum of RM260.8 billion, an increase of 3.4% from the 2016 Budget Recalibration. 9. Of which, RM214.8 billion is allocated for Operating Expenditure, while RM46 billion for Development Expenditure. This does not include contingencies which amounts to RM2 billion. 10. Under the Operating Expenditure, a total of RM77.4 billion is for Emolument and RM32 billion for Supplies and Services. 11. Meanwhile, a sum of RM103.9 billion is allocated for Fixed Charges and Grants. A sum of RM691 million is allocated for Purchase of Assets, while RM8I6.6 million for Other Expenditures. 12. Under the Development Expenditure, the economic sector will receive the highest share of RM25.9 billion, followed by social sector with RM12.2 billion. The security sector will be allocated RM5.3 billion and the general administration more than RM2.5 billion. 13. The revenue collection in 2017 is expected to expand at around 3% to RM219.7 billion. 14. In addition, the Government is expected to achieve the fiscal deficit target of 3% of GDP in 2017, compared with 3.1% this year. 15. Mr. Speaker Sir, Ladies and Gentlemen... I understand that these figures and numbers may not be easily understood. 16. In reality, the Government is always committed to implement an optimum budget for rakyat through prudent spending even though we are faced with global economic uncertainties. 17. The definition of prudent spending by the Government is similar to a sensible father or head of family manages his finances to meet household needs. 18. In other words, if previously we could afford expensive toys, however, in the present situation we could continue to do so but within our means. 19. This is also applicable for food and dining where one is advised to spend in moderation according to ones need. 20. Furthermore, Malaysia is known as Food Haven. 21. For example, during the recent Independence Message, I had given examples of good food at a reasonable price such as the Nasi Kandar Vanggey in Ipoh. 23. Nevertheless, the Government encourages such individuals, especially graduates to venture into entrepreneurship and we pray for their success. 24. In formulating the 2017 Budget, we have drawn learnings from the Surah Yusuf verses 43 to 49. As interpreted by the ulamas, one should plan and prepare during the first seven years, while facing the subsequent seven years of challenges in order to sustain economic resilience. 25. As a lesson learnt from the above historical event, about seven years ago, in 2008, Malaysia was also affected by the global economic slowdown. 26. Therefore, upon my appointment as the Minister of Finance, under the leadership of the former Prime Minister, Tun Abdullah Ahmad Badawi, we launched the First Economic Stimulus Package, amounting nearly RM7 billion to revitalise the economy. 27. The first stimulus package was just an interim measure. Subsequently in March 2009, a month after I took over the office as the Prime Minister, the Second Economic Stimulus Package of RM60 billion was implemented. 28. Clearly, this was a proactive measure to stimulate the slow economic growth at that time. As a result, the economy rebounded with GDP reaching 7.4% in 2010. 29. Alhamdulillah, following the various incentives from the stimulus packages as well as seven previous Budgets, our economy remains stable and on a positive trajectory. 30. In reality, the current uncertainties in the external economy are beyond our control. 31. The slower external economic growth is caused by subdued growth among all major economies, simultaneously. 32. As a result, global growth is expected to moderate 3.1% in 2016 from 3.2% in 2015. 33. Nevertheless, we are grateful that our economic growth remained stable and sustainable during first half of the year. 34. Clearly, the country's economy grew at 4.1% and we are confident of achieving a growth between 4% and 4.5% in 2016 and between 4% and 5% in 2017. InsyaAllah. 35. Indeed, we are now on the right track, as we have and are taking right decisions even though the measures were unpopular. 36. I would like emphasise, that all those major and crucial decisions were deliberately done. 37. As the saying goes, save for a rainy day, we have laid strong foundations for the country's long-term financial and economic position. 38. All these were achieved due to the Government's diligence and planning, focusing on various strategic measures since 2010.
particularly to reduce the dependency on oil and gas sector-related revenue from 41.3% in 2009 to 14.6% in 2016. 40. As a result of further diversification of our economy, the growth had been resilient and sustained despite the recent decline in oil prices by almost 50%. 41, Second: The Government's bold measure to implement GST had diversified the sources of revenue. We should realise that there are only 2.1 million income tax payers out of 14.6 million of the country's total workforce. 42. In addition, with the recent fall in oil prices, it is estimated a loss of Government's revenue by RM30 billion from income tax, corporate tax, royalty, PETRONAS dividend and Petroleum Income Tax. 43. Hence, we should be grateful with the implementation of GST, as the Government is able to support its expenditure amid limited resources. 44. I am pleased to report, the GST collection has reached nearly RM30 billion as of 19 October 2016. 45. I would like to stress, we should not believe the grapevine of the increase in GST rates. Those are just hearsays and are untrue. 46. Third, Subsidy Rationalisation. For example, the oil subsidy in 1995 stood at RM123 million, constituting only 0.24% of the overall national budget. 47. At its peak in 2012, it reached RM24.8 billion or 9.8% of the overall national budget. 48. Overall, the inefficient bulk subsidy system clearly burdens the Government's financial position and causes leakages. As such we have replaced it with a targeted subsidy system, benefitting those who are really in need. 49. It is evident, through measures and initiatives implemented by the Government, our economy records sustainable growth. According to the Purchasing Power Parity (PPP), Malaysia is now an upper middle-income country, surpassing many countries not only in Asia but also throughout the world. 50. Malaysia's PPP per capita has increased from USD23,100 in 2012 to USD26,891 in 2015. 51. From a different angle, the Government is aware of the rumours on the so called deteriorating investors' confidence on the Malaysian economy. 52. A nation's economy is highly related to perception, as without confidence there will be no investment to drive the economy. 53. But, if our own people, undermine and sabotage our economy, we are bringing down our own nation. 54. Therefore, accusations by irresponsible internal and external parties must be stopped! 55. Despite many challenges, the Barisan Nasional Government will do what it takes for the beloved rakyat, from Peninsular to Sabah and Sarawak, we will continue to propel the country forward. 56. Syukur Alhamdulillah, facts and figures have proven the truth. 57. For example, the total approved foreign investment was more than RM28 billion during the first half of 2016, an increase by 32% compared with the same period last year. 58. This excludes approved domestic investment which totalled to more than RM60 billion. 59. In fact, during my official visit to Germany last month, I met the business community who expressed their interest to continue to invest in Malaysia as they are confident with the Government's sound policies, meeting their expectations. 60. For example, OSRA.M has announced an investment worth EURI billion or equivalent to nearly RM5 billion. 61. This LED plant investment in Kulim, Kedah will be the largest and the latest in the world. 62. Insya-Allah, next week I will be heading to China and we hope to attract more investment. 63. Recently, according to Kaushik Basu, Chief Economist and Senior Vice President of the World Bank, as many nations suffer because of falling commodity prices, Malaysia stands out for having transformed itself from a poor, commodity-exporting nation to a modern diversified economy. 64. Each time the budget is discussed, many intellectuals will refer and deliberate on several important verses in the Al-Quran, among others, Surah Al-Hasyr verse 7, that, do not allow wealth to circulate only among the rich. 65. I have sought views from various ulama and learned Muslims regarding this verse. They interpreted that this verse has to be seen from a wider and more holistic context. 66. As elaborated by Imam Al-Mawardi, provisions or allocations to the rakyat such as in this Budget are subjective, taking into consideration their needs and benefits. 67, Indeed, to formulate a complex budget is not an easy task. As a Government that feels the pulse of the rakyat, in the past months, we have received thousands of ideas from various segments of the society. 68. The 2017 Budget is anchored on five principles and philosophies of the Government. Fifth: We uphold the national ideology, which is the Rukun Negara. As such, in governing the country, the Government has been firmly upholding the universal Islamic philosophy and principle of Wasatiyyah. This philosophy comprises moderation; balance; social justice; fairness; and excellence. This means that we are always striving for excellence, not just average and complacent, what more to settle for mediocrity. 69. While we strive to succeed through joys and sorrows, we have never forgotten exemplary leaders who have inspired us. 70. In this regard, we would like to express our deepest condolences to families of several individuals who have served the nation. I would like to share their stories though they were not members of Parliament. 71. First, Allahyarham Tan Sri Haji Abdul Aziz Tapa, who loyally served the party and people till he was 93 years old. 72. Second, another close family friend, Allahyarham Tuan Guru Dato' Dr. Haron Din. 73. Indeed, Malaysians have lost two respected figures. 74. Clearly, despite our political differences, Allahyarham Tuan Guru was highly respected for his contribution to the ummah. As such, the Government has conferred him the 2016 Maal Hijrah Special Award. We are sad and disappointed that there are certain parties that openly hate and insult him. 75. In fact, during my visit to the hospital, Allahyarham Tuan Guru hinted that both the feelings of love and hatred should not be too extreme. 77. We are approaching six decades of independence. During these years, public servants, which currently stand at 1.6 million have been the backbone and pillar of the nation's administration. Fourth: The Government has also decided to increase the motorcycle loan limit from RM5,000 to RM10,000. Fifth: The Government is concerned with public servants' housing needs and is committed to enable them to own houses. Ninth: To appoint the first group of doctors, dentists and pharmacists on contract latest by December 2016 due to constraints in permanent posts. For information, nearly 2,600 doctors who were unable to undergo housemanship in any hospitals will now serve on contract. Hopefully, this will be good news to them and their families. 79. Before proceeding with the tabling of the budget, allow me to clarify several repeated allegations and misconceptions that create fear among the rakyat, leading to public confusion on Malaysia's economic situation. 80. First misconception and misperception - the Government will go bankrupt. 81. In this regard, I would like to clarify that a government will be declared bankrupt only if it is unable to pay off its debt. 82. There are three reputable international rating agencies, namely, Fitch, Moody's and Standard & Poor's. 83. The ratings and reports from these rating agencies are accepted in assessing a country's ability in paying off its debts. 84. As a comparison, Fitch had rated Malaysia with A- compared with the Philippines (BBB-), Thailand (BBB+) and Viet Nam (BB-). 85. In fact, our rating is similar to that of advanced and larger economies such as Republic of Korea (AA-), China (A+), Taiwan (A+), Japan (A). 86. This means, bankruptcy is never in Malaysia's economic dictionary! 87. Second allegation - Malaysia is said to be a Failed State. 88. This is a false accusation. I would like to clarify the meaning of a failed state. It refers to a country that fails to implement most of its responsibilities and basic functions of a government. 89. This includes the failure of police and armed forces in maintaining national security and public order of the country; failure of the Government to pay salary of the civil servants; failure in providing basic amenities such as water and electricity as well as hyperinflation that could collapse the economy. 90. These characteristics do not exist in Malaysia and with the blessings of Allah, this Government will never allow our country to become a failed state. 91. This Budget is not intended to benefit any particular group. However, it is engineered to be inclusive for the well-being of the rakyat. 92. As illustrated in a household income pyramid, there are three main categories of rakyat in our country, namely T20 M40 and B40. 93. For the M40 group, the household income ranges between RM3,900 and RM8,300. 94. This M40 group includes singles as well as most working married couples, highly educated and skilled. 95. Alhamdulillah, this group do not face difficulties in meeting their basic needs. However, the Government intends to increase their disposable income. 96. This includes aspects such as job security, increase in income from time to time, housing, safety, education, health as well as balanced lifestyle among work, recreational and quality time with their families. 97. For public knowledge, B40 refers to the bottom 40% of households with monthly income RM3,900 and below. From the macroeconomic perspective, the existence of this group is common in any developing countries. 98. According to Khazanah Research Institute Report, the household income of the B40 households recorded faster growth rate compared with the income growth of M40 and T20 groups. 99. In the 2015 Budget, I have defined People Economy and Capital Economy. This time, I would like to add another important concept towards becoming an advanced economy i.e. public happiness. 100. What I mean, this Budget is not merely about income but it is related to quality of life such as free from crime, enjoy clean environment, with various colourful arts and cultures. 101. Also, attaining higher education, raising one's academic and intellectuality; with guaranteed healthcare services as well as access to efficient public transport. 102. With regard to environmental matters, we must continue to preserve our nature especially water catchment areas and declare these areas as forest reserves and national parks are kept as well as protected from intrusion. This will only become a reality if all state governments provide full cooperation in collaboration with the private sector and the rakyat. First: From the information and site visits, there are still villages without street lights. To brighten the villages at night, a total of 97,000 street lights and 3,000 LED lights will be installed at crossroads. This involves 7,500 villages nationwide, including Sabah and Sarawak. Fourth: To build and refurbish 17,000 units of destitute and dilapidated houses in remote villages and Orang Ashi settlements with an allocation of RM350 million. Fifth: To increase the supply of clean water with an allocation of RM732 million, targeting 5,200 houses, including the upgrading of FELDA water supply system. 104. In recent times, we have been facing various water supply issues in several states including lack of supply capacity; drought; pollution from industrial wastage and logging; and pipe leakages. 105. To improve capacity and ensure water supply, the Government will allocate grants totalling RM156 million and loans amounting to RM509 million. 106. In addition, a Water Supply Fund will be established immediately with an allocation of RM500 million to address water supply issues throughout the nation. Seventh: The Government is concerned about the welfare of urban residence especially those living in flats. These rundown flats are due to lack of maintenance, including malfunctioning lifts. Therefore, the Government allocates RM300 million under the 1Malaysia Maintenance Fund (TP1M) to repair facilities at flats and 113 People's Housing Programme (PPR) in urban and suburban areas. 107. In addition, the Government will implement People-Friendly Projects with an allocation of RM800 million. These projects include upgrading and building surau, small bridges, drainages, community halls, markets and kiosks. Priority will be given to local G1 and G2 contractors for the implementation of these projects. 108. Furthermore, a total of 69 Flood Mitigation Plans will be continued nationwide with an allocation of RM495 million. 109. 1 am pleased to announce the implementation of a new National Blue Ocean Strategy (NBOS) initiative, namely MyBeautiful New Home, especially for the B40 throughout the country with an allocation of RM200 million. 110. At the initial stage, a total of 5,000 units will be built with prices ranging from RM40,000 to RM50,000 per unit. 111. Interestingly, the Government will finance RM20,000, while the remaining will be paid as instalments by each owner. These houses will be built on their own land; land permitted by the landowner; and land awarded by state governments. 112. The Ministry of Urban Wellbeing, Housing and Local Government (KPKT) will build 9,850 houses under People's Housing Programme (PPR) with the allocation of RM134 million in 2017. 113. Meanwhile, a total of 11,250 PPR houses are being built with an allocation of RM576 million. These PPR houses will be sold between RM35,000 and RM42,000, even though the actual construction cost is between RM120,000 and RM160,000. Fourth: Revitalising eUsahawan and eRezeki programmes under the Malaysia Digital Economy Corporation (MDEC), comprising 300,000 participants with an allocation of RM100 million. 115. To ease the cost of living, the Government will provide nearly RM10 billion for subsidy allocation. This allocation comprises of fuel subsidies including cooking gas; toll charges; and public transport. 116. To assist paddy farmers, the Government will allocate RM1.3 billion to subsidise paddy price, seeds and fertilisers including hill paddy. 117. As an incentive to registered rubber smallholders, the Government will implement the purchase of floor price with an allocation of RM250 million. 118. As an additional measure, the Government will introduce Rainy Season Assistance with an amount of RM200 monthly for 3 months in November, December and January, benefitting 440,000 rubber tappers and smallholders. 119. Furthermore, to ease the cost of living of 57,000 fishermen, the monthly allowance of RM200 to RM300 will be continued. 120. Since the introduction of 1Malaysia People's Aid (BR1M), without fail, this programme has been well-received and obtained positive feedbacks from the recipients. 121. In an event that I attended, a Malaysian Indian BRIM recipient had expressed his appreciation towards the Government for the BRIM which had assisted his family. BR1M is not animal feed neither bait rather it is a sincere assistance from the Government as we always prioritise rakyat's needs. Hence, we provide more assistance. will be increased from RM400 to RM450. 124. At the same time, the Bereavement Scheme will be continued with the RM1,000 compensation given to the next of kin of BRIM recipients for households and the elderly category. Overall, the BRIM programme will benefit 7 million recipients with an allocation of RM6.8 billion. 125. In order to produce local workforce that meets the industries' requirement, TVET education capacity will be enhanced with an allocation of RM4.6 billion to TVET institutions. 126. Through NBOS, to optimise the Government's assets, nine unused Teachers' Training Institutes (IPG) will be transformed into Polytechnics and Vocational Colleges. 127. Finally, four will be become polytechnics, another four will be vocational colleges and one training institute for TVET trainers. 128. Through this creative initiative, the expenditure involves only RM400 million compared with RM250 million to build a new polytechnic. This will save the Government approximately RM2 billion. 129. Furthermore, a sum of RM270 million is allocated to upgrade educational equipment in TVET institutions as well as RM360 million for Skills Development Fund Corporation. 130. In this regard, double tax deduction is given on expenses incurred by private companies to provide Structured Internship Programme for students pursuing undergraduate degree, diploma and Malaysian Skills Certificate Level 3 and above under the TVET Program. This incentive is extended for a period of 3 years from the year of assessment 2017 until year of assessment 2019. 131. In addition, training matching grants and curriculum development to public TVET which successfully obtained assistance in the form of equipment from industries. 132. To enhance graduate employability, a sum of RM50 million is allocated to extend the 1Malaysia Training Scheme (SLIM) programme by GLCs to 20,000 graduates in 2017 compared with 15,000 graduates in 2016. 133. House ownership is an issue that is very close to my heart. The Government is committed in ensuring that every family could own a house. Government's vacant lands at strategic locations to GLCs and Perumahan Rakyat 1Malaysia (PRIMA) to build more than 30,000 houses with the selling price ranging between RM150,000 and RM300,000 which is much lower than the market price from RM250,000 to RM400,000. Second Concept: To build around 10,000 houses in urban areas for rental to eligible youths with permanent job including young graduates entering labour market. 135. PRIMA is well-received. To date, more than 12,000 units worth RM3.3 billion has been booked, while 85,000 units are at various stages of approval. 136. I would like to take this opportunity to announce a new special "step-up" end-financing scheme for the PRIMA programme. 137. Through this special scheme, financing will be easier and more accessible to the buyers with total loan up to 90% to 100% with loan rejection rate to be reduced drastically. 138. Application process for this scheme will be implemented effective 1 January 2017. This scheme is collaboration among the Government, Bank Negara Malaysia (BNM), Employees Provident Fund (EPF) as well as four local banks, namely, Maybank, CIMB, RHB and AmBank. 139. For example, an applicant with a monthly income of RM3,000 will only be eligible for loan more than RM187,000. However, through this special financing scheme, an applicant will be able to borrow more than RM295,000. 140. In addition, the stamp duty exemption be increased to 100% on instruments of transfer and housing loan instruments, to help reduce the cost of first home ownership, compared to 50% at present. 141. However, this exemption is limited to houses with the value up to RM300,000 for first home buyers only for the period betweenl January 2017 and 31 December 2018. 142. For Second Generation House infrastructure development, a sum of RM200 million is allocated to FELDA, RM100 million for FELCRA and RM100 million for RISDA. 143. There is good news for the taxpayers. Currently, there are 21 categories of individual tax reliefs. In order to facilitate tax payers in claiming the existing tax reliefs, the purchase of reading materials, computers and sports equipment be combined as the lifestyle tax relief. 144. This relief is extended to include the purchase of printed newspapers, smartphones and tablets, internet subscriptions as well as gymnasium membership fees. The relief is given up to RM2,500 per year, and will be effective from year of assessment 2017. 145. The NBOS initiative has successfully saved RM3.5 billion on Government's expenditure. 146. As it is well-received by the rakyat, four more Urban Transformation Centres (UTC) in Negeri Sembilan, Perlis, Pulau Pinang and Selangor and three more Rural Transformation Centres (RTC) in Selangor, Sabah and Sarawak will be built with an allocation of RM100 million. 147. As a new measure, each UTC will be provided with a Job Centre to assist matching between job seekers and potential employers. 148. UTC operates from 8am to lOpm, seven days a week. This is only possible with the Barisan Nasional Government. 149. Furthermore, other NBOS initiatives include 1Malaysia English, Coding in schools, Volunteering for International Professional and Global Entrepreneurship Community 2 with an allocation of RM40 million. 150. While implementing various Rakyat-Centric programmes, the Government is committed enhance long-term fiscal sustainability, among others, through the establishment the Collection Intelligence Arrangement (CIA) under the Ministry of Finance. It involves Inland Revenue Board (IRB), Royal Malaysian Customs Department and Companies Commission of Malaysia (SSM) as they will share data to enhance efficiency in tax collection and compliance. 151. In addition, the rate of stamp duty on instruments of transfer of real estate worth more than RM1 million, will be increased from 3% to 4% effective 1 January 2018. 152. Furthermore, various Rakyat-Centric projects will be continued through Private Finance Initiative (PFI) with an allocation of RM10 billion. 153. Professor HAMKA once said pure soul emanates from a healthy lifestyle, while sports and recreational activities will lead to a wholesome character-building. 154. However, BERSIH (healthy lifestyle) here does not refer to the BERSIH rally. 155. Talking about sports, we are extremely proud of our national Olympic and Paralympic contingents. For the first time, our national anthem Negaraku was played in Rio de Janeiro. 156. Alhamdulillah, our contingent has won four Silver medals and one Bronze medal at the 2016 Rio Olympic Games. Congratulations to our national Olympic heroes. 157. For the development of sports, a sum of RM1.2 billion is allocated. This includes RM450 million, especially for hosting the 29th SEA Games and the 9th Para ASEAN Games in 2017. Fourth: A sum of RM54 million is allocated to continue Sportsmen Development Programmes including Athlete Preparation Programme and Paralympic Athlete Preparation Programme. Fourth: To allocate RM4 billion for supply of drugs, consumables, vaccines and reagents to all Government hospitals and health facilities. 160. Referring to healthcare matters, I would like to introduce Dr Mohd Lutfi Fadil Lokman. He is an exemplary youth recognised by the United Nations through Hospital Beyond Boundaries Project, which he started in Cambodia. Congratulations and applause to Dr. Lutfi whom I considered as an icon among youth in the field of health. 161. In order to reduce overcrowding in public hospitals, the Government will cooperate with the private sector or NGOs to operate non-profit charitable hospitals based on Government hospital rates. A total of RM20 million is allocated in the form of loans for the purchase of hospital equipment. 162. The Government will allocate RM110 million, of which RM70 million is for medical assistance, benefitting nearly 10,000 underprivileged patients. 163. To encourage the establishment of more private haemodialysis centres, Government will provide one-off grants worth RM200,000 for purchasing of equipment with a total allocation of RM40 million. 164. The Government views the contagious diseases such as dengue and Zika seriously, and will implement initiatives to prevent and control these diseases. In addition, National Community Health Empowerment Programme will be expanded. These programmes involve an allocation of RM80 million. 165. From a different perspective the Government is concerned on the rising food prices as well as ensuring food security. 166. Therefore, a sum of RM1.3 billion is allocated to increase food production at a competitive price. 167. The allocation is to develop agricultural infrastructure such as drainage and irrigation, farm roads and marketing of agricultural products. High impact programmes including paddy estates, aquaculture integrated zone and cage fish farms will be continued. 168. In addition, Distribution of Necessary Goods Programme, opening of four MyFarmOutlets and upgrading of 150 Agrobazaar Rakyat 1Malaysia premise with an allocation of RM140 million. 169. Furthermore, the Government also encourages the development of dairy industry as well as madu kelulut and coconut, while reducing the dependability of imported animal feed through the development of corn plantation as a pilot project in Terengganu and Kedah. 170. The Government is concerned with the welfare of taxi drivers. 171. With us today we have two taxi drivers who appreciate the Government's effort in safeguarding their welfare. Thank you and let us give them a round of applause to Mr. Mohd Rais Hasan and Mr. Tan Woon Kong who are present here today. 172. I am pleased to announce, a grant of RM5,000 to purchase new vehicles and offer individual taxi permits, with an allocation of RM60 million. This will benefit 12,000 qualified taxi drivers who have ended their leasing contract with taxi companies. 173. Currently, most taxi drivers are not insured. Therefore, the Government will introduce Social Security Organisation (SOCSO) Scheme to individual taxi drivers with a monthly income up to RM3,000, with a launching grant of RM60 million. 174. Under this Scheme, the taxi drivers are required to contribute between RM157 and RM443 per annum, which is only RM13.08 per month. Should an accident occur while working, they are eligible to claim from SOCSO. 175. For example, taxi driver who lost permanent ability will receive a lump sum payment between RM43,000 and RM121,000 and a monthly payment between RM1,281 and RM2,624, for life. In the event of death, the next of kin shall receive Dependant's Benefit at a rate from RM945 to RM2,655 per month. 176. To assist the 340 group, especially BRIM recipients to generate additional income, the Government will encourage their participation as ride-sharing drivers such as UBER drivers, particularly those who own vehicles. 177. Their income could reach up to RM1,500 per month for part time drivers working between 10 to 40 hours per week and RM4,300 if more than 40 hours per week. 178. To those who do not own a vehicle, down payment will be made using BRIM and a rebate of RM4,000 will be provided for the purchase of Proton 'Hz. 179. To upgrade the drainage system and construct two Overhead Motorcycle Ramps at the Federal Highway in Selangor to mitigate floods in motorcycle lane and ensure safety of riders. For this purpose, an allocation of RM29 million is provided. 180. Under the capital economy, the Government will continue to implement pro-business strategies. 181. In line with the private investment which is expected to expand 8.1% to RM230 billion in 2017, more initiatives will be implemented. 182. To stimulate private investment, among the major infrastucture projects which will be implemented are the upgrading of Jalan Lok Kawi - Pengalat - Papar, Sabah; Jalan Kampung Keruak - Qua Musang - Kuala Berang; construction of Batang Lupar Bridge, Sri Aman; and the reconstruction of Sandakan Power Station Project. 183. In addition, for infrastructure and socioeconomic development, the five economic corridors, namely, Iskandar Malaysia, Northern Corridor Economic Region (NCER), East Coast Economic Region (ECER), Sabah Development Corridor (SDC) and Sarawak Corridor of Renewable Energy (SCORE) will be allocated a sum of RM2.1 billion. 184. Meanwhile, Malaysian Investment Development Authority (MIDA) will be allocated a fund of RM522 million. Among the industries that will be given emphasis are chemicals; electric and electronics; and R&D activities. 185. To invigorate domestic capital market, Small and Mid-Cap PLC Research Scheme will be introduced to conduct research on 300 companies. 186. Government-linked investment companies will allocate a special fund up to RM3 billion to fund managers licensed under the Securities Commission to invest in potential small and mid-cap companies. 187. In addition, Capital Market Research Institute will be established with initial funding of RM75 million, provided through Capital Market Development Fund. 188. On the other hand, in maintaining Malaysia as an international Islamic financial centre, I am pleased to announce that the period of income tax exemption to entities carrying out Islamic banking and Takaful business through the International Currency Business Unit (ICBU) in foreign currencies as well as stamp duty exemption on instruments of such activities, will be extended to the year of assessment 2020. 189. To encourage youths to make long-term investment, the Government will introduce Private Retirement Scheme (PRS). 190. Effective 2017, the Government proposes to introduce a one-off increase of the existing RM500 incentive to RM1,000 to PRS contributors with a minimum accumulated investment of RM1,000 during the period of two years. For this, an allocation of RM165 million will be provided. 191. For export promotion programmes to local SMEs by MATRADE, MIDA and SME Corp, a sum of RM130 million is provided through National Export Promotion Funds. 192. In addition, loan financing totalling RM200 million and insurance credit facilities with coverage valued up to RM1 billion will be provided by EXIM Bank to SMEs. 193. A sum of RM286 million is provided to increase exports of palm oil, rubber, cocoa and pepper. 194. A sum of RM50 million is allocated to conduct scientific research to enhance the quality of palm oil products. 195. In addition, a grant of RM30 million will be provided through Malaysian Palm Oil Board (MPOB) for replanting of palm oil by smallholders. 196. In addition, a sum of RM20 million is provided to upgrade estate roads, to facilitate palm oil smallholders. Second: Pioneer Status promotion and Investment Tax Allowance for new 4 and 5 star hotels will be extended to 31 December 2018. Third: Increase in tax deduction from RM500,000 to RM700,000 will be given to encourage sponsorship by the private sector in local and foreign arts, culture and heritage shows and performances. 198. In addition, the Government will promote Malaysia through Visiting ASEAN@50 Year Campaign in conjunction with the 50th anniversary of ASEAN as well as Malaysia as the host for the 2017 SEA and Para ASEAN Games. 199. To achieve the target of 32 million of tourist arrivals next year, the Government will extend eVisa to countries in the Balkans and South Asia regions. 200. Currently, digital connectivity is a revolution in economic activity, contributing nearly 16% to GDP of the country. 201. Through MDEC, a sum of RM162 million is allocated to implement programmes such as e-commerce ecosystem and Digital Maker Movement as well as the introduction of new location category as Malaysia Digital Hub. 202. The Government will also introduce the first Digital Free Zone in the world. It will merge physical and virtual zones, with additional online and digital services to facilitate international e-commerce and invigorate internet-based innovation. 203. On this auspicious evening, I would like to bring good news to all of you, particularly youths, regarding online connectivity. As an open democratic nation, the Government aspires to enhance the online information transmission channel. 204. I'm pleased to announce effective January 2017, fixed line broadband service providers will offer services at a higher speed for the same price. For example, a subscriber of 5 megabytes per second package at RM149 will enjoy a package with twice the speed, which is 10 megabytes per second. 205. Within the next two years, for this package, the speed will be doubled with the reduction in prices by 50%. 206. In addition, the Government will launch an initiative for ethernet broadband services in public universities to be increased to a maximum 100 gigabytes per second. 207. At the same time, Malaysian Communications and Multimedia Commission (MCMC) will provide RM1 billion to ensure the coverage and quality of broadband nationwide reaches up to 20 megabytes per second. 208. The Government had declared that year 2017 will be the Startup 85 SME Promotion Year in line with the role of SMEs in significantly contributing to nation's growth and labour market. 209. To promote the development of SMEs, the Government will allocate a total of RM75 million to implement programmes under SME Master Plan. 210. In addition, guarantee up to RM15 billion is provided under the various schemes of Syarikat Jaminan Pembiayaan Perniagaan (SJPP) to be extended till 2025. 211. In addition, to boost export-oriented SMEs, the Government will provide 2% rebate on interest rates charged to SME borrowers under SJPP scheme. 212. This rebate is limited to a total accumulated funding of RM 1 billion which involves an allocation of RM100 million for a period of five years. 213. To invigorate startups, a total of RM200 million from the Working Capital Guarantee Scheme (WCGS) Fund will be specifically allocated to startups. 214. To encourage investment in high technology startups, a new pass category, namely Foreign Knowledge Tech Entrepreneurs will be introduced. 215. Meanwhile, to rejuvenate creative industry and film production, Film in Malaysia Incentive, Arts and Culture Revitalisation Agenda as well as FINAS Content Creation Hub in Santubong, Sarawak and Kota Kinabalu, Sabah will be implemented. 216. The Government will also establish a committee represented by artists to further invigorate arts and cultural sector. All these initiatives involve an allocation of RM80 million. 217. Children between two and five years of age are in their essential phase of physical and mental growth. 218. Therefore, the Government will continue with the Additional Food Assistance and Per Capita Grant to children enrolled in TABIICA and TASKA programmes. 219. The Government will also improve daily nutritional food packages that are more balanced including 250m1 of milk, raisins and eggs. 220. This initiative will benefit nearly 280,000 children, with an allocation of RM200 million. 221. Furthermore, a sum of RM132 million is provided to improve access to preschool education in government schools for free, benefitting 200,000 children. 222. Every rakyat in this country deserves to get complete access to education. Third: Extend the English language proficiency in schools through Cambridge English, Dual Language and Highly Immersive programmes with the provision of RM90 million. 224. Another good news, MCMC will provide free tablets to assist teaching to 430,000 teachers with an allocation of RM340 million. each to students from families earning up to RM3,000. RM50 million for MARA Junior Science Colleges. 226. In ensuring higher education to be at par with the global standards, a sum of RM7.4 billion is allocated for 20 public universities. 227. From this amount, a sum of RM1.4 billion is allocated to four university hospitals, RM300 million is also allocated for empowerment of five research universities. 228. In addition, a sum of RM100 million is allocated to higher education institutions to foster research culture as well as to increase publications and intellectual properties. 229. To enhance effectiveness of assistance to students in institutions of higher learning, the Government will replace book vouchers with student debit card worth RM250 which can be used to purchase books, computer accessories and internet access, benefitting 1.3 million students. RM21 million through Ministry of Youth and Sports. Third: 10% discount for repayment through salary deduction or direct debit in accordance with the repayment schedule. The above incentives will be effective tomorrow, 22 October 2016 till December 2017. Fourth: GST relief for the purchase of aid equipment for registered PWDs without going through Private Charitable Entities. The list of equipment eligible for tax relief will be expanded. 233. Indeed, for us PWD brings broader meaning. They have special and exceptional abilities as they have proven themselves as world-class sports heroes. Ms. Siti Noor Radiah Ismail. 235. The Government recognises the role of community leaders such as village heads in creating harmony and prosperous society. 236. Therefore, the Government agrees to increase the allowance of village heads, chairmen of Village Development and Security Committee, including heads of New Villages and Orang Ash i from RM800 to RM900. 237. Public transport is central to the daily mobility for the rakyat in moving towards development. The rakyat looks forward towards a safer, more efficient and comfortable public transport. 238. As such, the Kelana Jaya and Ampang LRT lines commenced operations in June 2016. 239. Meanwhile, the Sungai Buloh - Kajang MRT line will operate in December 2016, benefitting 1.2 million users in Klang Valley. 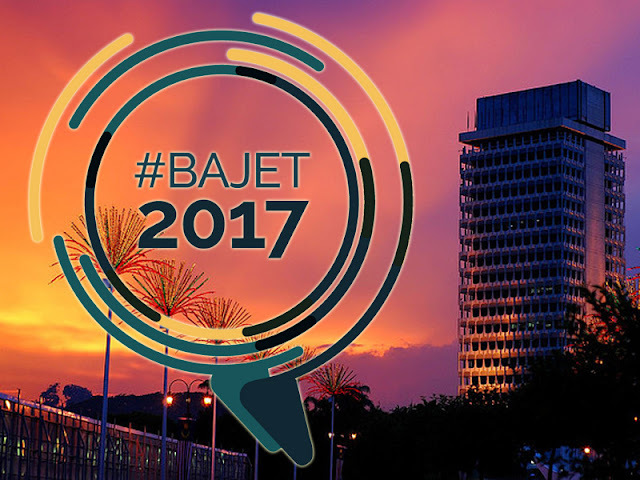 Fourth: To increase the trip frequency of ETS for the Johor Bahru - Padang Besar route, involving procurement of nine train sets till 2019. In addition, 10 more new train sets will be purchased in stages up to 2019, with an overall allocation of RM1.1 billion. 241. Every year, Orang Ash i benefits from each Budget tabled. 242. This evening we have invited few Tok Satins whose settlements have benefitted from the past budgets. 243. Give a round of applause to Tok Batin Awang bin Lijon from Kampung Orang Ash i Jelebu, Negeri Sembilan and Tok Batin Taha bin Ahir from Kampung Bukit Bangkong, Sungai Pelek Sepang, Selangor. 244. This Budget allocates RM222 million for water treatment project in 42 Orang Ash i villages, economic and entrepreneurship development programmes as well as Village Resettlement between Sungai Ruil, Cameron Highlands, Pahang. 245. For the Native Customary Rights, a total of RM20 million is allocated for the land survey in Sabah and RM30 million in Sarawak. 246. The Government is always concern on the needs of the Chinese and Indian communities. In this regard, a sum of RM50 million is allocated for the development of Chinese New Villages, a sum of RM50 million for SMEs loans through KOJADI as well as RM20 million for microcredit loans under the supervision of Malaysian Chinese Women Entrepreneurs Foundation. 247. Furthermore, RM20 million will be channelled to the 1Malaysia Hawkers and Petty Traders Foundation to provide loans to Chinese hawkers communities. 248. For the Malaysian Indian community, a sum of RM50 million is allocated for programme to increase capacity and income as well as RMI50 million for business financing programmes through TEKUN and Amanah Ikhtiar Malaysia (AIM). 249. For the National-type Tamil schools, the Government will expand pre-school programmes to 50 schools with an allocation of RM10 million. 250. In this regard, I want to make a policy statement that the Government is committed to mainstream the programmes to safeguard and empower the Malaysian Indians in the national development agenda. I take this opportunity to wish Happy Deepavali. 251. To uphold the Bumiputera agenda, last week I officiated the 60th year Anniversary of Universiti Teknologi Mara (UiTM). 252. Clearly, UiTM has achieved its establishment objective by producing almost 700,000 graduates to date. There are successful academicians, administrators, technocrats, corporate figures as well as honourable Ministers. Second: A total of RM100 million to AIM for their various entrepreneurship programmes. scaled entrepreneurs to develop their businesses including a new scheme, TEMANITA, especially for women micro entrepreneurs. Indran sio Ganesan who is a successful in repair of electrical appliances. Pendidikan Bumiputera for Peneraju Skil dan Iltizam, Peneraju Professional as well as Peneraju Tunas programmes. With us, in this august House are two individuals who have benefitted from the Yayasan Peneraju Pendidikan Bumiputera. They are successful in the 6-star hotel and architecture sectors. Congratulations and a round of applause to Miss Denilia and Mr. Syahmi. 254. In a nutshell, the agenda of empowering Malays and Bumiputera will continuously be upheld. 255. Recently, there were allegations that the 2017 Budget is of no substance and the Government has insufficient fund. 256. In fact, an Opposition leader stated that Malaysia will face a difficult economic situation this year. 257. Now, who is without substance? Where did the storm originate? And we first put the rakyat's needs. 259. The Government really appreaciates the contribution of the SMEs in generating economic growth as well as employmemt in the country. 260. In fact, 97% of all businesses in the country are from the SME sector. These businesses also contribute 36% of the country's GDP last year, 65% of total employment and 18% of nation's exports. 261. Therefore, the Government is confident that SME sector has the capability to propel forward to further increase their contribution to the nation's economy. 262. For the 2017 Budget, I would like to announce several good, high-impact and important matters to companies including SMEs. 263. To appreciate the achievements of companies which had been successful in increasing their revenues, the Government has decided to introduce a new scheme specifically for the year of assessment 2017 and 2018. Four percentage point for increase in chargeable income of 20%. 265. For example, if a company's chargeable income for year of assessment 2016 is RM10 million and increase to RM12 million in year of assessment 2017, the income tax imposed for the first RM10 million is 24% or RM2.4 million. Whereas the difference of RM2 million increased in year of assessment 2017 will be taxed at 20% equal to RM400,000. This means the effective rate is 23.3% and the total amount of tax to be paid is RM2.8 million with tax saving of RM80,000. 266. Currently, for all SMEs the tax rate on chargeable income up to the first RM500,000 is reduced from 19% to 18% effective from year of assessment 2017. 267. To boost the local vendor development programme in the manufacturing and services sectors, double deduction on expenses incurred by the anchor company, will be extended until 31 December 2020. 268. Together with unity, the Government has never compromise with safety and public order. 269. The contribution and sacrifices of our armed force will always be appreciated. This includes their sacrifice to defend the nation during Emergency. 270. Together with us this evening, are representatives from the veterans of the security forces, war heroes in defending the nation's sovereignty. 271. Their contribution cannot be repaid as they are invaluable. 272. I was made to understand that present with us in the gallery include representatives from the army, Navy, Air Force as well as Royal Malaysia Police who have served during the Lahad Datu tragedy. 274. Therefore, I am pleased to announce the Government will provide Special Insurgency Incentive Payment to veteran Malaysian Armed Forces amounting to RM55 million to those who are yet to receive their special incentive. 275. To enable veterans who have lost their abilities during their service is eligible for this incentive. For an example, a corporal who has lost 80% of their ability during his service is eligible for bulk incentive of RM34,000 and monthly incentive of RM590 subject to current calculation. This is a new incentive in addition to Disability Pension. 276. The Ministry of Defence (MINDEF) will be allocated a sum of RM15.1 billion. Of which, a sum of RM1.8 billion is provided for defence asset maintenance such as aircraft, patrol vessels, communication equipment, buildings and weaponry. The ATM will be equipped with patrol vessels and 8x8 armoured vehicles. 277. In addition, a sum of RM1.3 billion is allocated, among others for communication devices, rations and uniforms. 278. To enhance effectiveness of ESSZONE operations, a sum of RM323 million is allocated for personnel deployment at the eastern border of Sabah. 279. In addition, the Government will create Sea Basing at the East Coast of Sabah waters and Helicopter Forward Operating Base. Also, the Government will place AV8 GEMPITA 8x8 and 4x4 armoured vehicles in Lahad Datu as well as deploy of Hawk fighter jets and Eurocopter EC-725 helicopters squadron at the Labuan Air Base. 280. The armed forces will also build and upgrade roads under the Jiwa Murni Programme with an allocation of RM114 million in the interiors of Sarawak. 281. In addition, Armed Forces School Ferry services involving 15,000 children of ATM nationwide will be continued. 282. Meanwhile, the Ministry of Home Affairs (KDN) is allocated RM12.8 billion including a sum of RM8.7 billion for the Royal Malaysia Police. Among the major programmes and projects include building 12 district police headquarters, commando 69 training centres as well as procurement of vehicles and equipment. 283. In addition, a sum of RM60 million is allocated to enhance the effectiveness of crime prevention in cities including the omnipresence and Motorcycle Patrol Unit. 284. The Government also recognises the role of RELA in ensuring a safe and peace society. For this, the Government will provide RM80 million to more than 200,000 RELA members. 285. Two of their representatives are with us today, please put your hands together for their contribution. 286. To ensure a safe and peaceful neighbourhood, the Government will provide RM40 million to reintroduce grant to the registered Residence Association. These grants of up to RM10,000 is provided for purchase of security control equipment, cleaning and maintenance of neighbourhood. 287. Women are the backbone and bedrock of a nation's development. Since days of old, warriors were not only limited males, but also females. 288. A few days ago, I met with a female warrior. She was the sole Malaysia representative who is brave, bold and determine. Together with her friends, she carried out her humanitarian mission until she was detained by the Israel regime. 289. Alhamdulillah, she has returned home safely. Let's give a round of applause to Dr Fauziah Hassan. 290. With regard to women's affair and to mainstream women's role in the nation's development, a sum of RM2 billion is allocated for programmes such as I-KIT, I-KeuNita and Women Career Comeback. 291. The Government also allocates RM30 million for women to undergo mammogram screening and receive Human Papilloma Virus (HPV) vaccination to prevent cancer, for free. 292. Talking about another success story of women, let's congratulate Ms. Lam Shu Jie. She has made a scientific breakthrough in structurally nano-engineered anti-microbial peptide polymers (SNAPPs) research at a global level. I was informed she is a studying in one of the universities in Australia. 293. To support working women who are still breastfeeding, the Government will introduce a new tax relief up to RM1,000 which is claimable for purchase of breastfeeding equipment. This relief is claimable biennially effective year of assessment 2017. 294. Further, to ease the burden of working parents, a tax relief of up to RM1,000 will be given to individual taxpayers who enroll their children aged 6 years and below, into registered nurseries and pre¬schools, from the year of assessment 2017, benefitting 40,000 individuals. 295. As a wasatiyyah Islamic country based on Ahli Sunnah Wal Jamaah school, the Government from time to time will continue to expand the eminence of Islam on the right path. 296. As such, the Government rejects any form of extreme liberal or extremism. 297. From this angle, the role of religious men particularly the imams as well as mosque and surau Committee Members is viewed seriously by the Government, especially on their welfare. 298. As such, today we are pleased to invite a few imams and bilals who have long contributed in surau and mosques nationwide. 299. Let us look at the gallery and screen of thousand of imams, bilals and siaks who have been promoting Islamic activities in mosques and suraus. Please give them a round of applause. 300. In line with that, I am grateful that these imams are among the 4,611 pilgrims that have been funded by GLCs to perform Hajj. 301. In this regard, the Government through JAKIM will increase the monthly allowance of Imam from RM750 to RM850. This will benefit nearly 15,000 imams throughout the nation. 302. Meanwhile, a one-off payment amounting RM500 will also be given to nearly 16,000 Bilal and Siak throughout the nation to appreciate their service in managing mosques. 303. The Government is pleased to announce that KA.FA teachers' allowance will also be increased from RM800 to RM900 a month, benefitting nearly 33,000 KAFA teachers. 304. The Government recognises the current interest and high demand for tahfiz education. Therefore, for the first time, the Government is allocating RM30 million to coordinate tahfiz education through National Tahfiz Education Policy. 305. Please give a round of applause to the representatives of the KAFA teachers and Tahfiz students sponsored by the Government. 306. Many intellectuals and humanitarians in the world such as Mahatma Ghandi advocate that "if you want to reach real peace in this world, we should start educating children". 307. On this Friday, we have brought children into the august House to expose them to be future leaders. These children are pre¬schoolers from KEMAS, TABIKA, TASKA and PERMATA. 308. In appreciation of KEMAS assistants, their allowance will be raised from RM400 to RM500, benefitting 11,000. 309. Another round of applause to two KEMAS assistants who are here with us today. 310. Together with us this evening is children from PERMATA and KEMAS, the future leaders of our nation. 311. A sum of RM85 million will be allocated for PERMATA programme involving 50,000 children among which for the establishment of the Top STEM Talents Excellence Centre at Academy of Sciences Malaysia. In addition, Institut Pen.didikan Guru Kampus Raja Melewar in Negeri Sembilan and Kampus Tuanku Bainun in Pulau Pinang will be renovated to become PERMATA Pintar and Berbakat Centre. 312. Another important message is that the Government will take positive measure to amend the Bankruptcy Act 1967 from early next year, concerning those declared bankrupt especially 'social guarantors' for example scholarship guarantor and among others those certified with chronic disease as well as elderly. The details are being worked out and to be announced soon. 313. These are the measures, initiatives, allocations, sincere efforts by the Barisan Nasional government for the rakyat. 314. This is a very committed Budget which does not seek political popularity, instead, to ensure strong and resilient economic fundamental including policies on fiscal targets, spurring economic activities and healthy long-term financial system of Malaysia. 315. Indeed, Barisan Nasional is a brave and bold government, and we never run away from issues. 316. We never betray, never fear failure and never run away from battlefield. 317. To us, Barisan Nasional, failure is not an option, and success is what we strive for. 318. Thus, I am pleased to announce as soon as the Budget is concluded, the Government will launch a series of national discourse to chart the nation's direction on a new canvas as the 2050 National Transformation and will be branded as TN50. 319. New Economic Policy under the Allahyarham Tun Razak was planned to create a successful New Generation within 30 years. So is TN50 which will span three decades to form a calibre nation state as well as with par excellent mindset. 320. TN50 will be kick-started by the young diverse generation of all races through national discourse as decided by the Cabinet will be conducted by the Ministry of Youth and Sports and under my patronage, as the Prime Minister. 321. Let the TN50 bear witness be recorded in history that we are the responsible Citizens and Forefathers, to leave behind the best and the greatest legacy to be inherited by the future generation. 322. From now on, TN50 is our lucky charm. Let the old legacy pass. The future of Malaysia, we Recreate. 323. As such, even though we are faced with waves of challenges but we embrace it with an open heart and soul of freedom. 324. Therefore, my friends in Barisan Nasional, let us close ranks and be one in thought, we strengthen our team. 325. I would like to take this opportunity to express my highest appreciation to my Deputy, Datuk Seri Dr. Ahmad Zahid Hamidi for his undivided loyalty. 326. Also, to the loyalty of my fellow Cabinet members, component Paty Leaders as well as the public servants of this country for the past few decades. 327. To the civil servants, I know that you will have sleepless nights if I do not announce this. I have good news. 328. As a token of appreciation for the commendable service by the public servants, I am pleased to announce a special assistance of RM500 to all public servants, while special payment of RM250 for Government retirees. This payment will be made in early January 2017. 329. Although we are in pain, let the rakyat reap the benefit. 330. Let our shoulders be burdened by the insults, while the rakyat will continue to be safeguarded. 331. As the old saying goes, the King and the rakyat cannot be separated. Equally true, for the Government and the rakyat. Sehati Sejitua. 332. I want to express that the Government loves to see the rakyat be happy and prosper. As the learned ones say, Government and rakyat are inseparable. 333. Finally, with the grace of Allah, Barisan Nasioanl government is confident that the win of victory of Sarawak State Election has blown over the Sungai Besar and Kuala Kangsar by-election will eventually be the torch of endeavour, which we believe and confident with the blessing of All Mighty will bring the ultimate victory in the 14th General Election to the Barisan Nasional, InsyaAllah. 334. A warrior never retreats. 335. May Allah bless us here and in the hereafter. Did the Malaysian Budget go the direction you expected it to go?